Long-term visitors and Expats in Germany are often faced with the problem that most travel insurance companies in Germany offer a maximum term of only 12 or 24 months. Long-term health insurance for more than 2 years is hard to find or is extremely expensive. 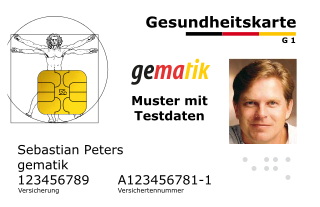 The German statutory health insurance (GKV Krankenkasse), for example in most cases can not insure foreign guests at all. What can Ex Pats do anyway? For all Expats and Long-term visitors in Germany we recommend the long-term health insurance from one of the biggest german insurance company group called "Hanse-Merkur Versicherungsgruppe". In our opinion it offers the best services for the relative low insurance cost and the monthly premium starts from only 58 Euro /month. The tariff cost depends on your age, but also on the fact if you wish to include additionally a coverage also in the NAFTA states (USA, Canada and Mexico) or not. For example if you need only Germany or only Europe and don't need USA, Canada or Mexico, then this is their cheapest healtn insurance tariff ( from only 58 Euro /month, all details here... ). The health insurance offers a longer term of up to 5 years (in some cases even longer insurance periods are possible) and It is perfectly suited for ex patriots, emigrants and business travelers in Germany, but also for a long family visit for example by foreign parents, a girlfriend or fiancé and for long-term traveling tourists in Germany, Austria and all other Schengen and EU states. Foreigners, who want to enter Germany for at least 6 months or more, are considered long-term travelers and, apart from a few exceptions, need to get a german visa from the german embassy or consulate abroad. Proof of travel insurance for the entire duration of the stay is one of the most important conditions for obtaining a visa for Germany. And here is your second advantage if you take the above mentioned insurance tariff from the "Hanse-Merkur Versicherungsgruppe". Relative quickly after your online application you will get an email with all your insurance documents as PDF files. These documents are specifically for presentation at embassies, consulates, foreign authorities and Border stations. Print and use them for Visa Application or Extension. Be aware, that your travel insurance must meet the current valid regulations for a Shengen Visa as agreed upon by the Council of the European Union on 13.07.2009 . This is an important requirement at the embassy and immigration office, and it is important in order for your insurance to be recognized at all. Often tourists purchase cheap health insurance from foreign local providers, which, unfortunately, have poor coverage and are therefore often not recognized by the embassy. The Long-term visitor health insurance by Hanse-Merkur Versicherungsgruppe (from € 58,00 / month) meets the current valid requirements at the embassy for a Schengen visa. After filling out the Online Application, your insurance certificate will be promptly and conveniently displayed on your screen. Simply print it right away and use it immediately as proof of insurance at the immigration office. Expats, emigrants and long-term travelers, who for any reason are staying in Germany without a valid health insurance, must pay eventually for the expensive treatments by a doctor or hospital out of their own pocket. The cost of treatment and medication in Germany however is extremely high and can easily reach several thousand Euros that in this case must be paid for out of pocket. Without health insurance you must even carry the cost of possible transportation to return back to your home country. The same is also true for all medical bills in case of an acute emergency or a flu exam by your regular physician. All this can get quickly very expensive for you ! On the other hand a long-term travel insurance starts from only 58 Euro/ month and has a term of up to 5 years (in some cases even longer) and is therefore well suited for the needs of all long-term visitors, expatriates, family guests, emigrants and business travelers (like freelancers) in Germany. This cheap Incoming Health Insurance protects you well from financial risks and is actually one of only a few travel health insurances that offer travel protection for such a long term. An important advantage for you is also the fact that the travel protection meets the current valid visa requirements of the German Embassy. It can therefore serve as proof of insurance for a visa application or extension for a visa for Germany. 1. Am I eligible for this Long-Term Travel Insurance? 2. Can I use this insurance at the embassy when applying for a visa for Germany? Yes, this health insurance meets the current valid visa requirements of the German Embassy (for ex. for a Schengen Visa) and can therefore be submitted at the embassy together with your visa application for Germany. After your online Application you will get quickly your insurance policy and you can immediately print the policy and use it for your visa application in the german embassy. 3. Am I also covered during an interim trip back to my home country? Yes. The health insurance also covers temporary return to your home country. Depending on the selected tariff, the total duration shall be 30 days (Basic), 45 days (Comfort) or 90 days (Premium) per insurance year. However, a visit to the home country must be communicated in writing form prior to the trip. 4. When and how will I receive my medical insurance documents? After submitting your Application Online and approval, your insurance policy will be displayed on your screen. You may immediately print this policy and use it for a visa application.